POITOU, FRANCE – “My father told me to plant trees,” said a neighbor last night. “It was right after I bought this place. Of course, I was young… I was busy… I didn’t have time to plant trees. “Now, I tell my sons to plant trees while they’re still young. So they can enjoy them later. This crypto is in the same position Bitcoin was a few years ago, right before it soared. It’s just starting to get some buzz… especially in cryptocurrency circles… but it hasn’t hit the mainstream news yet. Once it reaches a wider audience, the gains it’s delivered so far could seem like a drop in the bucket. We’re revealing its name tonight in a special webinar at 8pm (ET). Register here before it’s too late. What follows is a meditation on something we cannot know – tomorrow. The future is a closed book, insofar as it is possible to know what will happen. But that doesn’t mean the future won’t happen. And although it is terra incognita – a place you’ve never been before – that doesn’t mean you shouldn’t pack your old familiar toothbrush and a warm sweater; it might be a lot like home. Long ago, an old man decided to turn his farm over to his son and his wife. This was readily agreed. But the son’s wife and the old man didn’t get along. Finally, the wife persuaded her husband to throw him out. And so he did. A few minutes later, the young boy came with a blanket, but his father could see that it was only half a blanket. “Why did you cut the other half off?” he asked. All of a sudden, a pattern came into view. And the future didn’t seem so unknowable. Like a tall tree, the future casts its shadow backward over the present. If you think it will rain later in the day, you take an umbrella in the morning. If you think stocks will go up, you buy now. If you think you have only two years to live, there is no point buying a refrigerator with a 20-year guarantee. Meet Dave. He’s a regular guy… works for a trucking company… makes around $63,000 a year. And until recently, he’s never made a trade in his life. But in the next 12 months, Dave is on track to bank $235,668 using a special trading method that identifies massive stock price eruptions TWO FULL DAYS AHEAD OF TIME. No one believed he could do it (not even his wife, Angie). See how Dave’s proving all the doubters wrong here. The invention of money greatly increased man’s interest in tomorrow. You could grow tomatoes, sell them for gold coins, and enjoy your harvest years into the future. Or you could borrow the coins now… and pay for them with next year’s tomato crop. But what if there was a drought next summer? What if you didn’t live through the winter? What if a fungus or a swarm of locusts attacked the crop? Savings are always a gift to the future. Debt is always a burden on it. Suppose you were to plant black walnut trees. It could take 50 years before they mature. It will be a gift to your children. But what if a pest kills them? What if people no longer want natural wood a half-century ahead? What if you borrowed the money to plant them? The further ahead you look, the more risks you can’t see. Logically, the farther out you go, the more you are likely to run into something that will upset your plans. So the longer term the debt… the less likely you are to be paid back. Logically, too, the more debt there is outstanding, the more likely that some will never be paid back. Most investors don’t realize how quickly self-driving cars are advancing. In fact, by the end of 2017, fully self-driving cars could reach the mass market. This is the hottest trend in technology right now. And if you act quickly, you could make a fortune. I’ve used my decades of experience as a Silicon Valley executive to identify three key self-driving stocks that could make you a fortune this year. And there, in front of us, is the heaviest ton of bricks the future has ever had to shoulder – nearly $20 trillion of U.S. government promises, not counting the roughly $200 trillion of off-the-books obligations. No one seems to be worried about it. The stock market is going through one of the periods of lowest “volatility” – price swings – ever recorded. Stocks are hitting record highs… and interest rates are still at epic lows. But ahead, the path – poorly lit and strewn with rocks and banana peels – is treacherous. Somewhere in mid-September, for example, lies a major trap – a debt “ceiling” Congress imposed on itself. But it’s not just the feds who face obstacles. Consumer debt to disposable personal income is at an all-time high. Mortgage payment to disposable personal income is also at an all-time high. It’s classic subprime: hasty loans, rapid defaults, and, at times, outright fraud. Student debt, meanwhile, has doubled since 2009; it now totes to $1.4 trillion. What kind of way is this to treat them? Alas, the future has cast a dark shadow over America’s young people. And according to a study by the New York Fed, student debt is having consequences far beyond just transferring wealth from young people to the old cronies in the education sector. It’s undermining America’s most important industry: housing. Burdened with student debt, young people cannot afford to buy houses. This leaves the bottom rung of the housing ladder unoccupied. There are starter homes available but few solvent starters to take them… which makes the whole housing market weak and vulnerable. August, September, October… shadows lengthen. Someone stumbles. The U.S. economy may be in trouble… but the global bull market in stocks is alive and well. 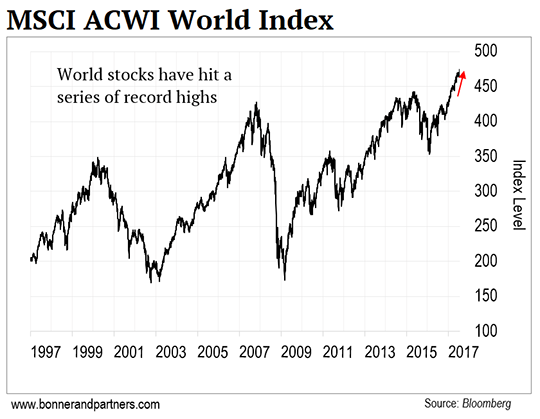 The MSCI World Index (ACWI) tracks over 2,400 stocks listed in 23 developed and 24 emerging market countries. When people talk about “the stock market”… this is it. And as you can see from today’s chart, this index has been setting a series of new record highs. It’s climbed 175% since bottoming out at 173 in 2009. The traditional brokerage house could soon be a thing of the past. Technology has made it easier for brokers to strike off on their own. And the big firms are feeling the pinch. Quant funds use complex mathematical models to direct investment decisions. They increased in popularity after the financial crisis. But one large fund is down more than 20% in 12 months, highlighting that no investment strategy is perfect. Should the Economy Serve the Nation? In this classic essay, Bill considers the difference between fair trade and free trade, and which is needed to truly make America great again. In today’s mailbag, readers consider the state of health care in America. The one bad thing about healthcare in this country today is that it is extremely expensive. Pharmaceutical companies offer treatments that are expensive and at best treat the symptoms with a lot of potential side effects. It makes me think that the healthcare industry in this country really does not want to cure you, it only wants to treat you and at great expense. We get no help from the medical doctors as we get all kinds of conflicting information about what is best to do. Buying insurance to help cover the costs of possible treatment has been the time-honored way to help with the costs. However, those costs are rising at an alarming rate, making it impossible for most people to afford good insurance. Meanwhile the healthcare industry, which I see as the pharmaceutical companies, healthcare equipment companies, and the insurance companies, seem to have carte blanche to charge whatever they want. If you do not pay, you just may die if you need treatment. Our Congress seems to rely on the healthcare lobby along with a lot of other industry lobbyists to support their reelection campaigns and their retirements. As a result, Congress appears to pass legislation that benefits them at most of the electorate’s expense. They claim to be public servants, but to me they often seem more like public crooks. I couldn’t help but agree as I read your article “The Evil Genius of Obamacare.” Our government has grown too big and too bureaucratic. We have too many regulations and a tax system bought and paid for by those with resources to get good deals for themselves. But can we get government completely out of our lives? We know from history that Industry exploited its workers until unions and labor laws came along. Do we want children working in factories again? Do we want unsafe workspaces? Do we want unregulated banks and financial institutions exploiting the masses with no recourse? Do we want unregulated airspace and sea lanes? How about food inspection? So, while I agree with you that too much government is a problem, no government is also not workable. If only we could find the right balance. And finally, a sharp-eyed reader caught the following error in yesterday’s Diary. Please advise Bill that “many a slip ’twixt cup and lip” is an ancient proverb, perhaps originating with Homer, but it does not occur in Shakespeare. At 8 p.m. 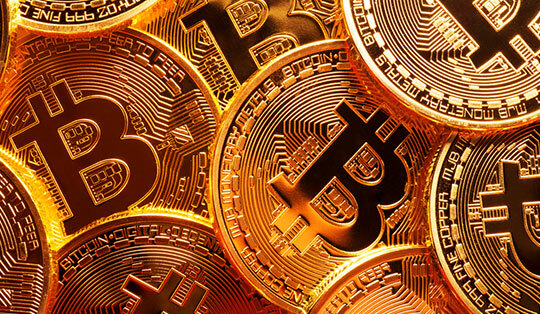 ET, colleague and cryptocurrency expert Teeka Tiwari will be hosting a free cryptocurrency training webinar. During the event, Teeka will reveal what he’s calling the “next bitcoin” and another of his top crypto picks.